Tune2Air WMA3000A is the latest wireless bluetooth music adapter designed to integrate with the original Audi/Mercedes/VW Factory connector to allow bluetooth music streaming without any wires! 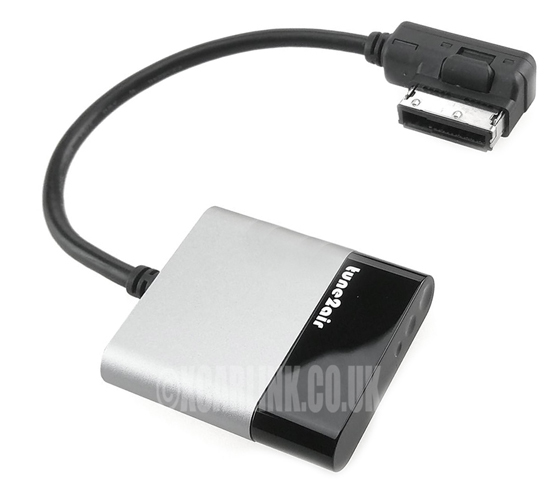 It is incredibly simple to use - instead of manually plugging your iPod/iPhone into the media socket every time enter the car, you can instead connect the Tune2Air WMA3000 with integrated cable to the original media socket which you would connect your OEM iPod lead to. It also opens up the possibility to connected Android and Windows Mobile devices to your system such as the Samsung Galaxy S5/S6/S6 Edge. The Tune2Air is left in the car permanently and it will connecting automatically. Thanks to the latest Bluetooth technology tune2air is also able to show the song title and track ID on your original in-car display. Plug and Play - No installation required. Wireless connection with all Smartphones including Apple iOS, Android, Windows Mobile etc. Access and control play, stop, next and previous song via multi-functional steering wheel. You can still keep Tune2Air connected with the original or aftermarket Bluetooth handsfree kit.